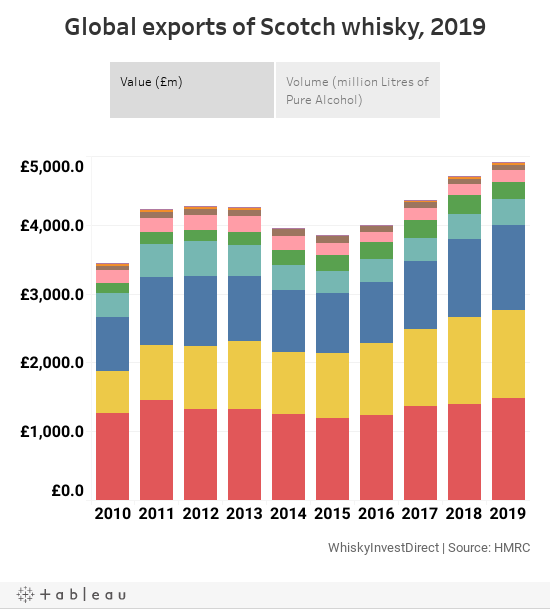 EXPORTS of Scotch whisky reached an all-time high in 2018, with both global spending on and consumption of Scotch hitting record levels, write Rupert Patrick and Leon Kuebler for WhiskyInvestDirect. A grand total of £4.7bn was spent worldwide on Scotch whisky last year, representing an increase of 7.8% on the previous record set in 2017. Scotch whisky is also more popular than ever across the globe. For the first time on record, more than 40 bottles of Scotch were sent abroad every second, as volume exports rose 3.6% year-on-year. All in all, over 357m LPA (Litres of Pure Alcohol, industry standard unit of trade) were dispatched overseas in 2018, beating the previous record set in 2011 by 13m LPA. Continuing premiumisation within established markets was clearly shown in the performance of single malt Scotch, which rose by 11.3% to a total value of £1.3bn despite a slight drop of 0.4% on last year. Blends (including bulk exports) provided the main driver of volume growth, up 4.0% on 2017, while also achieving a 6.5% increase in its overall Pound value. The enduring popularity of Scotch in key markets remains strong, as Scotch whisky’s largest markets outperformed the general trend. The number of Pounds earned from Scotch’s top-ten most valuable markets was up 8.8% on 2017, while the overall volume of whisky sent to Scotch’s ten biggest consumers rose by 5.4%. Of these, the United States, the biggest spenders on Scotch whisky in the world, reach a landmark by exceeding £1bn spent on Scotch for the first time, as shipments to North America rose by 12.8% in value. Shipments to the European Union, Scotch’s largest market, exhibited moderate growth of 1.4% in value but a drop of 3.8% in volumes, as the overall quantity shipped to their second- and third-largest markets by volume, Spain and Germany, declined by 9% and 18% respectively. More encouragingly, exports to France, the largest consumers of Scotch, rose by 5.3% in volume, with spending up 2.0% in turn. Asia & Oceania was the best performing region in 2018, with double-digit rises in both value (+15%) and volume (+12.7%) compared to 2017. The strength of premiumisation was evident, as several key markets, such as Singapore and Taiwan, exhibited high growth in value sales in spite of overall declining volumes. The most significant growth was seen in India, where spending on Scotch rose by more than a third on last year off the back of a 25% increase in volume. Although India is the world’s largest consumers of whisky, Scotch has traditionally been hampered by the 152% tariff placed on its import, which has tended to favour domestically-produced spirits. 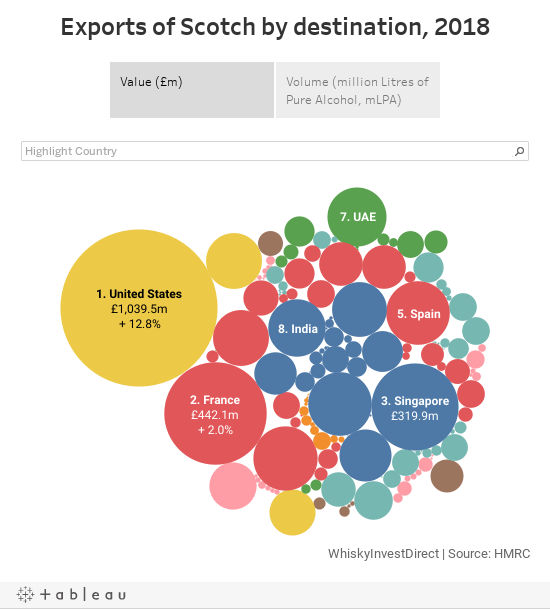 Despite this, Scotch exports to India have more than tripled in value since the start of this decade, with volume sales of both single malts and bottled blended products increasing by more than 50% on 2017 alone. Rupert Patrick, CEO of WhiskyInvestDirect, commented: “The Scotch industry faces Brexit from a strong position, building record-high demand worldwide. “Export values rising faster than volume confirms the underlying trend of premiumisation in Scotch whisky. “While Bourbon, Japanese and Irish are benefiting from the overall growth in world whisky demand, Scotch as a brand continues to extend both its reach and its dominance of the premium and super premium categories. “Driving the premiumisation of Scotch whisky is its USP of long maturation in the barrel. The world's drinkers are increasingly well-informed and discerning, and they’re happy to pay more for fine whisky aged for longer.